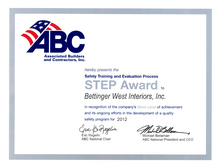 Award for Safety Training and Evaluation Process from Associated Builders and Contractors. 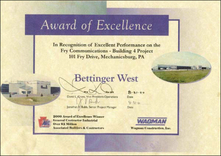 Award of Excellence given to us for our work at the Fry Communications Building in Pennslyvania. Certificate of Appreciation given to us for our work on the United States Secret Service Building in Washington, D.C. 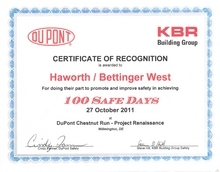 Certificate of Recognition from KBR Building Group for 100 days safe on the jobsite.